In the south of Dalmatia, where the string of Adriatic islands ends and the open sea begins, at the foothills of Srđ hill lies the pearl of the Adriatic, a UNESCO World Heritage Site that dates back to the 7th century. The city of Dubrovnik, which offers a surpassingly rich cultural heritage and a bewildering array of visitor services, houses one of the most beautiful marinas in the Adriatic, a mere 6 km from the city centre. For 15 years in a row ACI Marina Dubrovnik has been awarded the Blue Flag for its perfectly clean sea, and has been declared the best marina in the Adriatic (in the 250-450 berth (mooring) category) in the “Flower of Tourism – Quality for Croatia” competition for three consecutive years (2010-2012). It is one of the safest marinas to berth (mooring), keep and maintain your vessel in. All year round it provides shelter for 380 boats in wet berths and 140 in dry berths, and can accommodate mega yachts up to 60 metres long. Golf in ACI marina Dubrovnik: the unique project ACI Golf Range from June 2017! The coastal area of the Dubrovnik region, comprising the islands of Korčula, Mljet, Lastovo and the Elaphite archipelago, as well as the Pelješac peninsula, makes ACI Marina Dubrovnik an ideal starting point for a complete boating adventure. …that at the entrance to the Rector’s Palace (Knežev Dvor), the most important public building in Dubrovnik, which used to house the Republic’s government and its Rector, one can read the indicative inscription Obliti privatorum publica curate (“Forget private affairs, take care of public ones”). …that the Dubrovnik Summer Festival traditionally opens with a performance of the “Ode to Liberty,” with lyrics by 17th-century Dubrovnik poet Ivan Gundulić and music by 20th-century composer Jakov Gotovac. …that the last flash of Dubrovnik’s independence flared in 1813 during a short-lived uprising against French rule. The uprising, led by Đivo de Natali, ended with the entry of Austrian troops. The ACI marina is located at the end of the Rijeka (“river”) Dubrovačka inlet, whose width varies between 170 and 400 metres all the way to the easily identifiable monastery in the village of Rožat. The landmark to be used when approaching the mouth of Rijeka Dubrovačka is the islet of Daksa, which can be rounded from any side. On the northern cape of the islet there is a lighthouse (Fl W 6s 7m 10M). The exact position of the lighthouse is 42°40.2’ N 18°03.5’ E. The entrance to the mouth of Rijeka Dubrovačka is marked by a lighthouse on Cape Kantafig (Fl R G 2s 8m 4M). 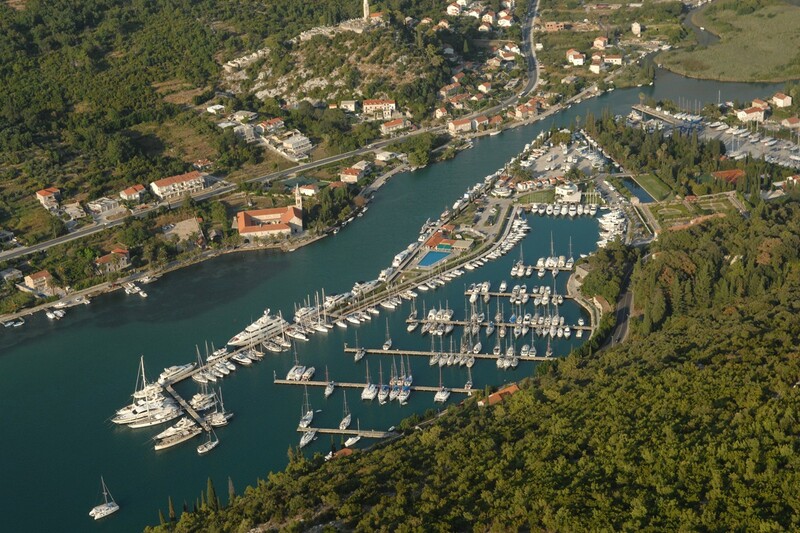 The route following the riverbed leads to the Mokošica lighthouse (Fl R 3s 6m 4M) and on to ACI Marina Dubrovnik. From Rožat the inlet becomes narrower and shallower. The water depth is 3-5 metres. The marina it is protected from river currents by a long breakwater, and at night it is floodlit. Note: It is recommended to use the official navigational charts published by HHI Split: 100-27, 100-28, 50-20, MK-26, and Plan 83.